To honor the sorority’s principle of scholarship, Beta Omega Zeta Chapter of Zeta Phi Beta Sorority, Inc. held its annual Scholarship Reception on July 25, 2015 to award scholarships to deserving high school seniors pursuing higher education. 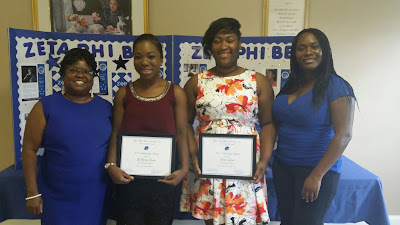 Chapter President Annie G. Lewis and Scholarship Chairperson Jere’ H. Parks presented the 2015 Annie M. Conyers Scholarship to Ty’Tiaunna Thomas and Ebone’ Jordan for recognition of academic excellence. Each recipient was awarded a $500.00 scholarship. Ty”Tiaunna Thomas is the daughter of Bertha Thomas and Samuel Thomas. Ty’Tiaunna is a 2015 graduate of Monroe Comprehensive High School in Albany. She will be attending Spelman College majoring in Biology. Ebone’ Jordan is the daughter of Mr. and Mrs. Elijah and Kimberely Jordan. She is a 2015 graduate of Terrell County High School of Dawson. She will be attending Middle Georgia State College majoring in Nursing.